fibre optic instruments, components and consumables at a competitive price as well as providing excellent customer service to meet our client’s urgent requirements. > Instruments – Fusion Splicing Equipment, Advanced Laser Diode Systems, UV Light Sources etc. > Active Devices – Optical Transceivers, Fibre Amplifiers, MEMS Devices, Optical Switches etc. 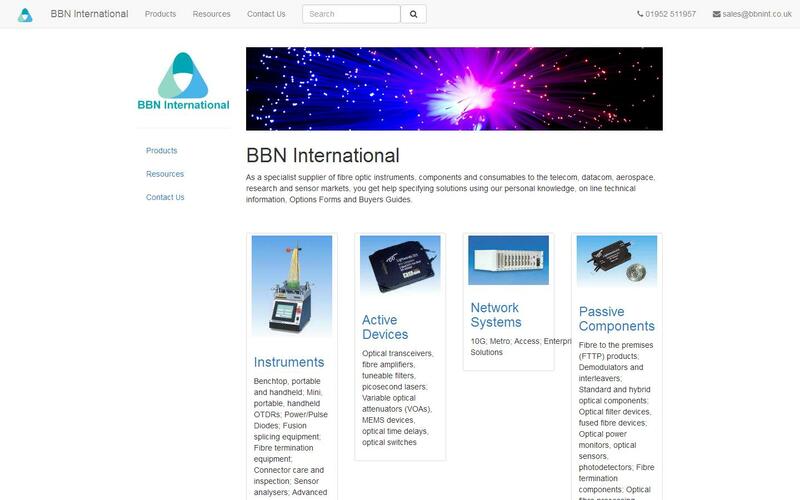 > Network Systems – Transmission Equipment, System Micro Switches, Optical Transport Platforms etc. > Passive Components – Optical Power Monitors, Fibre Termination Components, Fused Fibre Devices etc. BBN International work closely with clients to ensure that their needs are fulfilled at the highest possible standard. We as a company will always provide customers with the finest fibre optic products which offer the right technical specifications and quality for their application. Our company will also offer any help and support that is required as well as a buyer’s guide and option forms. 3 fibre SM & PM coupler/WDM and N fibre MM combiner fibre tapering manufacturing equipment from Oscom feature long tapering length, unilateral, opposite, accelerated or decelerated tapering for both normal, high power & lensed components. NanoSpeed optical switches from Agiltron are solid state, PI, PM, low loss, high reliability & with response of <50ns, very fast. With devices such as C/D/WDMs, beam splitters, dichroics, bandpass & edge filters, Lightwaves 2020 make thin film coatings for aerospace, biomedical, display, telecom, defence, sensor, instrumentation, UV, Raman and spectroscopy applications. With manual, electronically controlled & array configurations, Lightwaves 2020 make high performance adjustable optical filters based on in house thin film filter technology including angular, linear, tuneable, high speed & custom versions. Lightwaves 2020 make a wide range of high performance EDFAs including compact, MSA compliant and rack mounted versions in booster, gain block, pre-amplifier and full function formats with optional variable gain and extended temperature range. Microsens Entry Line, Standard & Profi Line DIN rail mounting rugged switches with PoE give high performance optical networking at Gigabit & Fast Ethernet speeds for industrial applications in rough environments including utilities and railways. Future-oriented cabling concepts are characterised by their flexibility. In addition to the Phase Demodulators and Interleavers, Optoplex continue to release new products for coherent detection including 90° Optical Hybrid, 2x4 & 2x8 Coherent Mixers and Balanced Photo-Receivers based on free space optics. WAVESPECTRUM 488nm pigtailed laser diodes use laser welding to guarantee long-term reliability of the laser structure. Both Lead Sulphide and Lead Selenide detectors provide 0.5 to 5.0um wavelength range with 64 and 128 element arrays. Comcore make advanced fused fibre splitters, couplers, taps, combiners, WDMs etc. There products are high reliability and high performance with much unique technology. They also make plastic & spun fibre components. BBN supplies the full range. With a modular & multi-port media converter system with chassis from 1-28 slots and myriad plug-in modules, 19" gigabit Ethernet switches up to 28 ports, PSUs and network management software, Microsens make everything to network whole buildings. Lightwaves2020 make angular, linear variable, wideband tuneable optical filters. ModuleLink make a huge range of optical transceivers including XFP, QSFP, CFP, Xenpak, X2, SFP+, GBIC, CSFP and SFP with data rates up to 100Gbps. Tuneable transceivers enable very flexible network systems. Contact BBN International for more. At only 10x6.8x4.6mm, Agiltron's etMEMS Utra-Mini optical switch is available in 1x1, 1x2, 2x2, dual 1x2, dual 2x2, quad 1x1 reflection or transmission versions. With high power & extremely short pulse lengths, ALS make 375 to 1600nm optical heads with 20ps to 5ns pulse durations and 10mW to 1W peak pulse power which are driven by digital control units with repetition rates up to 125MHz. TheFibers make a range of fibre connector care equipment including the 2 in 1 cleaner & inspection scope and slim push action manual ferrule cleaners. With versions for all ferrule sizes BBN International supplies the full range. Optical Phase Demodulators or Delay Line Interferometers convert phase modulation to amplitude modulation for data rates of 2.5, 10 & 40Gbps. Designed for use in phase modulated optical communication systems. Contact BBN International for more.